While I always invest with the expectation of holding the shares for a number of years, it doesn’t always work out that way. The stock market is a volatile and unpredictable place and sometimes what was attractively valued one day may look significantly less attractive just a few months later, and that’s pretty much what happened with this investment in Royal Dutch Shell PLC (RDSB). The shares were added to my model portfolio in December and from that point onwards they were up and away, registering gains of more than 16% in just 8 months. Of course I would love to claim that I had some special insight which allowed me to see that Shell’s shares were about to advance so quickly, but I can’t. The reality is that these short-term gains are almost entirely down to luck, with perhaps a small amount of help from an attractive purchase price. Shell is a relatively obvious purchase for an income-focused, defensive portfolio; it’s a big company with global operations and it has a long history of paying a progressively growing dividend. It had managed to grow the dividend at 9% a year through the previous decade and that dividend growth appeared sustainable too, with revenues and profits increasing at a similar rate. Shell had run into problems in recent years, not least of which were the financial crisis and the popping of the oil price bubble. From 2009 dividend growth has been slow and recent quarterly updates have disappointed the market. 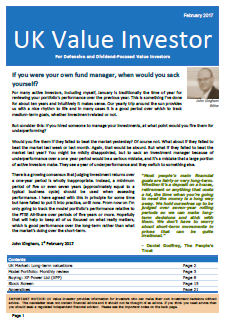 As investors became more uncertain about the company’s future a higher yield was required before investors would buy. However, if you are generally less concerned about uncertainty than other investors, or if you believe that there is always uncertainty regardless of what other investors think, then what appears to be fairly valued to the market can instead look decidedly under-priced and perhaps even worth investing in, and that’s exactly what Shell’s high rank on my stock screen suggested. Usually I like to write something about how the decision to hold on through the ups and downs of a particular investment have resulted in solid gains over time, but here the holding period has been so short that almost nothing in the real world (i.e. outside the world of daily share price gyrations) has happened to Shell. 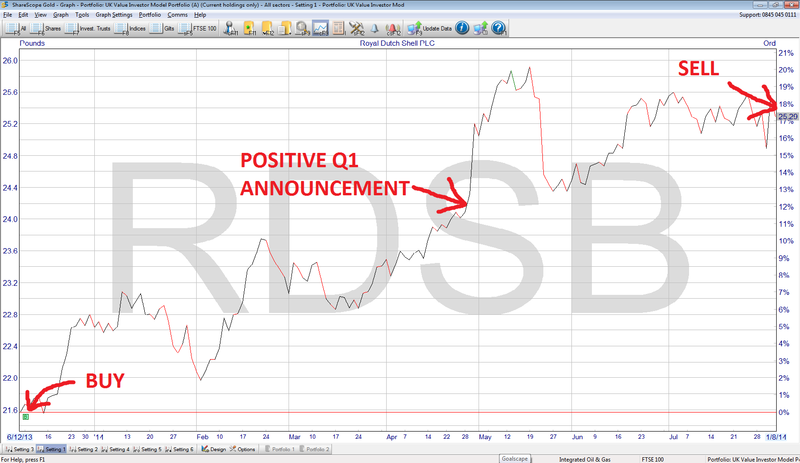 The “almost” bit of the almost nothing that happed was the announcement of the 2013 results and the 2014 Q1 results. With the 2013 annual results came a change to the company’s fundamentals, i.e. its long-term growth rate, growth quality and cyclically adjusted earnings, all of which form the basis of my approach to valuation. When the shares were bought the company’s 10-year growth rate was 8.1%, its growth quality (i.e. consistency) was 83%, its cyclically adjusted earnings were 211p per share and the previous year’s dividend had been 109.6p. After the 2013 results were announced in January the 10-year growth rate dropped to 6.9%, growth quality fell to 63%, cyclically adjusted earnings increased by 4% and the dividend increased by 3%. So the company had continued to grow, but its long-term growth rate and quality had declined. The overall effect was to reduce the implied “fair value” estimate for Shell, so in effect the company had a rising share price and a falling fair value price, which of course reduces its attractiveness as an investment. As for the Q1 results, they were better than the market had anticipated and caused a pronounced spike in the share price, but it was a short-term effect and in general I pay little attention to quarterly results anyway. Just using the enormously over-simplified dividend yield plus growth rate approach the projected returns at that point were 13.2% a year (a 5.1% yield projected to grow at 8.1%). All of the quantitative factors have deteriorated, but they’re still better than the market averages. For example, the FTSE 100’s yield is only 3.5% and the growth rate of its fundamentals such as profits and dividends is closer to 3% than Shell’s 7% growth rate. So why am I selling Shell even though it still seems to be a good investment? First of all I would agree; I do think Shell is still a good investment, with an above average yield and perhaps an above average chance of growing that dividend faster than average. But my investment strategy is not just to own stocks with a “good” combination of growth, income, quality and value, but to hold the stocks with the “best” combination. When a company’s shares can no longer be classed as the “best” they are replaced, but not so often that transaction fees become a drag on performance. While Shell’s fundamentals decreased in attractiveness as its share price increased, many other shares were doing the opposite, pulled lower along with much of the UK market which has struggled to go anywhere in recent months. The supermarket’s have fallen off a cliff, while many other companies with successful track records have been beaten down at the slightest sign of weak results. As Shell has gone up other shares have gone down, which creates an opportunity to sell high(er) and buy low(er). This is one of the main reasons why diversification is so important. It not only lowers risk but also increase the odds that something in the portfolio will be going up while something else in the market is going down. If a portfolio was tightly focused on one sector then I think this opportunity to buy low and sell high would be diminished. And so on that basis I have recently sold the entire Shell holding from both the model portfolio and my personal portfolio, and I will be looking to reinvest the resulting cash into a new holding next month. Yes John, the supermarkets have fallen off the cliff. Each and everyone investor has understood that their dividend policy is untenable. I am buying Morrissons myself as well expecting an M&A. At this moment in my calculations it trades well below its book value. There are not too many possible buyers, but I expect the Germans retailers may make their move and a US private equity firm will respond to it. This will be the ideal scenario. I bought Shell well later than you, when things in Ukrain started to go nasty (Crimea). I would not sell it, this is my insurance policy in case Russia retaliates or Ukrain will not let the Russian gas flowing this winter. I am well diversified in the energy sector and have big expectations for this sector – certainly a ‘cold winter’ will help. Hi M, thanks. Yes I think sticking to principles is a major part of success, otherwise you end up investing in an ad hoc manner, not applying best practice and forgetting important lessons. As for Shell, I think there are lots of reasons to hold onto it, but whether it’s a buy or a sell for any individual investor will depend on what they have in their portfolio. That’s why I don’t give buy or sell recommendations, because I don’t know what anyone reading this article has in their portfolio. If everything else in an investors portfolio was junk then Shell would probably be a good stock to buy, so it’s all relative to the rest of the portfolio. As for geopolitical factors, I’m definitely of the Ben Graham school here. Although I don’t go as far as Graham, who like to remove ALL speculation and just buy hard tangible assets at less than their “scrap” value, I do try to minimise speculation. Generally I just assume that the future will, in most cases, be “business as usual”, which it usually is for these sorts of large and mature businesses (although business as usual does not mean a walk in the park!). I question just one point in your article. You state that a) the dividend yield of the ftse 100 is 3.5% and b) its long term growth rate is about 3%. I don’t question a) but for b) I believe the historical data shows a growth rate of 4 to 5% when measured either since the start of the index (30 years) or even over the last 10 years. You’re right, over the very long-term dividend growth has been around 4 or 5% and over the past decade dividend growth has been about 4% going by the data I have. However, it can also depend on how you measure growth. Rather than measuring the growth rate between two distinct years such as 2004 and 2014 (which is about 4%), the 3% I quoted is the growth rate of a rolling 3-year average of dividends. I do this because I don’t want my growth measure to be dependent on the ups and downs of a single year, such as 2010 when the FTSE 100 dividend shrank. But in the big scheme of things I don’t think it matters too much whether you think the growth rate of the market is 3%, 4% or 5%. There’s so much noise in business and investing, I think the most important thing is to be in the right ballpark, which any of those figures are. The share price growth in the last 6 months Is largely down to the new CEO selling many assets and committing to returning more cash to share holders in favour of uncertain exploration. You are right, Shell is becoming a shareholder friendly company and I see this as an important feature to have it in the portfolio. 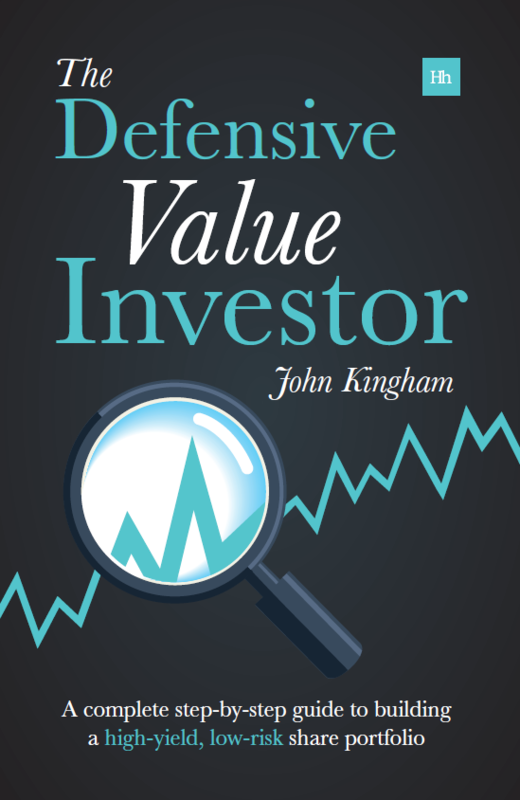 Graham did not spend time on the question ‘why value stocks re-rate’, however J M Keynes spent time on that. He explained the credit cycle and how this is important in value investing. In simple words, the fact that a company is cheap (on different metrics: book value, PE ratio, etc) will not help the company to re-rate. A prime example are Japanese stock market, they were cheap for the best part of 25 years and still cheaper now comparing with US and UK counterparts. If Ben Graham was around now probably he would have been invested at least 50% in Japanese stock. The answer lies in credit: Japanese people have become adverse to credit, forcing their Government to become the only borrower. But I shall let this aside, the Japanese conundrum is a future financial crisis waiting to happen. Value companies are very dependent of the nature of the credit cycle, credit flowed back to some extent into property and as a result builders and and property related companies re-rated heavily. Credit did not flow into M&A yet and it may not flow for years, I just don’t know. Cheap companies are bought or become targets and then they re-rate but without M&A and credit that will not happen. I look at the supermarkets now, because they own lots of land (property related) and some shops are not profitable and need to be closed. Morrisons is my prime target, as it is the smaller and cheaper of them all. It has £9bln worth estate. Obviously there are £4bln debts of one sort or another. I did buy some shares and I would buy more if the price comes down. But if there is no M&A activity we may get stuck with the stock, and the Morrissons management will sell a few properties to finance a losing money business. Interesting change announced today in the accounting rules – IAS 19. The surplus of the pension schemes will not be reflected in the balance sheet of the company as an asset. In a way it is right, the surplus doesn’t belong to the company but to the trustees. It applies to Shell as its defined benefit pension schemes have a surplus. There are a few other changes in the IAS 19 related to pension schemes in deficit. Changes will apply from 2017. Hi John, What would your expectation be for this stock to fall back to? I think the market is pretty efficient and so in the vast majority of cases (including this one) it’s not possible to have any expectations for future share prices. Shell could fall to 2,000p but it could just as easily shoot up to 3,000p. There’s no way to tell because in the short-term price movements are dominated by investor sentiment which is effectively random (knowing my luck it will shoot up to 3,000 now that I’ve sold). John, I think you made a good call. I bailed at 3350 and moved cash to something else. Given the oil glut I suspect there could well be a protracted slide in the price to sub $90. Now no one can’t vouch for Putin’s intentions, so if he really is insane and wants to destroy the Russian economy then all bets are off. RDSB could perform well as you stated, because the investors will see the sell off of assets as consolidating and good for the share price. Family silver springs to mind so I’ll pass. Neil Woodford also dumped oil (fortunately also BP) when he diagnosed that they were borrowing more and more and divesting assets to shore up the dividend – always a scary tactic. John-she’s probably right – but it’s great fun anyway. Hi John, Tempted back in at 1969? – well below your original purchase price, or has the oil price game change and the BG bid uncertainty changed the picture too much? Hi LR, the price is getting there for me, but not quite there yet. If I owned it I would hold at this level, so I certainly don’t think it’s expensive. The reason I wouldn’t buy now even though I previously bought at £21 is the continuously weak results of recent years. These have reduced its growth rate to effectively zero for revenues and earnings over a decade. The dividend keeps going up, but unless revenues and earnings start going up as well then that dividend is going to hit a wall at some point. On the positive side though, if the dividend is maintained (adjusted by whatever factors relating to the BG deal) then at about 6% that certainly looks pretty interesting. Don’t be surprised if I buy it again some time this year!